Yesterday I had the chance to visit the Norðurál aluminum plant in Grundartangi and to hear about the “Icelandic“ model it has used for managing the company, for providing opportunities for Icelandic contractors, and for supporting the community. 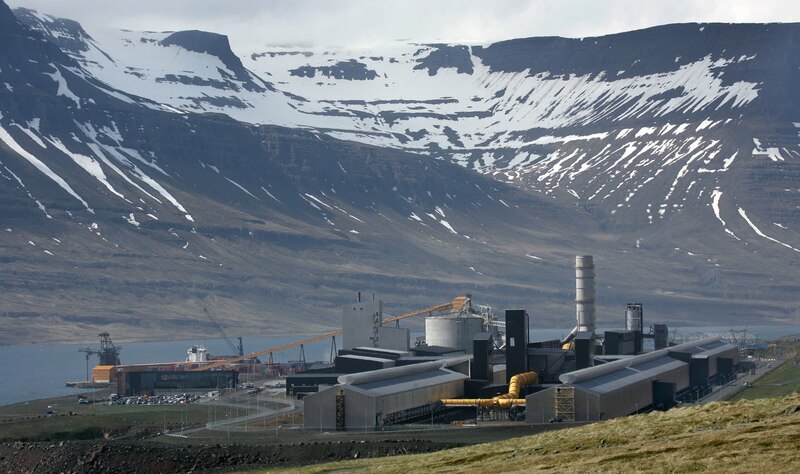 The American owned plant is operated by highly skilled Icelandic employees. After an investment of over $1 billion (118.66 milljarðar ISK ) the benefits to Iceland are evident: over 500 direct jobs, increased Icelandic exports, and benefits for the communities surrounding the plant and Reykjavik. Norðurál, for example, sponsors the the Akranes ÍA football team and also co-hosts one of Iceland's largest football tournaments for the younger generation. The United States also benefits by having such close investment relations with Iceland. 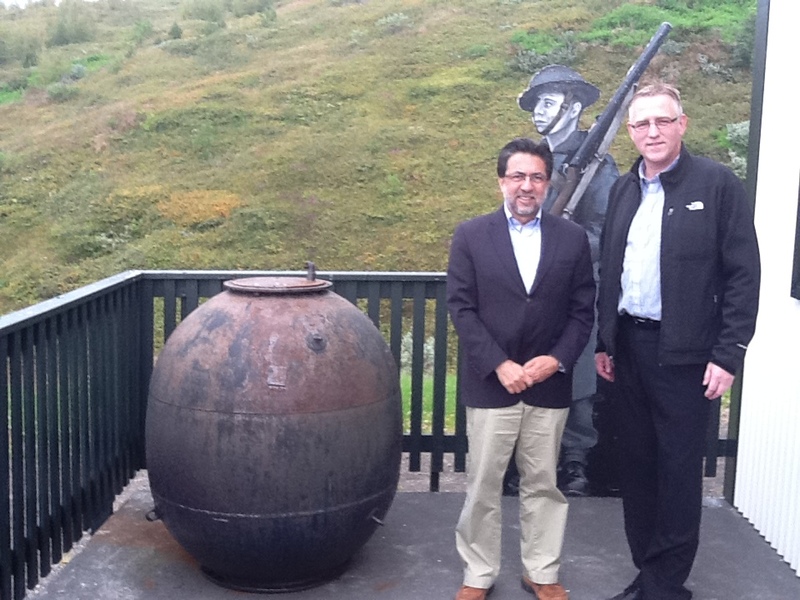 I can understand why the community in Reykjanes looks forward to the establishment of a similar plant in their area. Reyðarfjördur also hosts the excellent Icelandic War Time Museum. The photos and memorabilia collection are excellent as they evoke a time when Iceland, the U.S. and the United Kingdom partnered to save their way of life. The museum has plenty of anecdotes that highlight the deep ties between our countries. The museum also reminds today´s generations of the sacrifices that many Icelanders and Americans made so that we can live in freedom today. The Museum Director, Pétur Sorensson, is an inspiring force whose energy and dedication built a fine museum. It was also a great surprise to learn that Pétur had spent time in Honduras at the same time I served there during overseas post. His Spanish is excellent. In Höfn, we had the pleasure of meeting Hjalti Þór Vignisson, one of the youngest, if not the youngest mayor in Iceland. His energy and enthusiasm for the city and its surroundings was contagious. He told us about his plans for the future and his successful efforts to put the city on a sound financial footing. We also ate together what I consider the best langoustine in Iceland at Humarhöfnin (Lobster harbor). I highly recommend it for anyone looking for an incredible meal. 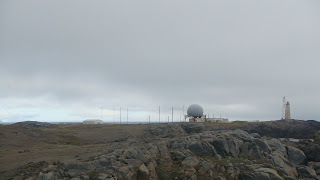 I visited the radar station in Hofn, one of four NATO radar installations in Iceland. The facilities are first-class thanks to the dedication and professionalism of the Icelandic authorities responsible for their operation and upkeep. These facilities play a critical role in the collective security of NATO, of which Iceland is a founding member, but more importantly, these facilities also give Iceland essential situational awareness about what is going in the airspace around the country. This is critically important for search and rescue operations at sea. One can say that these radars are Iceland's eyes and that we are all better off having them. The Reykjavik rock music scene is well known around the world and has a well deserved reputation for being creative and unique. This is why my wife and I gladly accepted an invitation to a concert by Ham, a venerable Icelandic Rock band that has gained loyal audiences in the U.S. and the U.K. To be honest, we really liked the music which set a mood reminiscent of impending doom. The vocalists drew the audience with interesting modulations and sudden twists and turns. We were afraid we were going to be the oldest members of the audience, but we were glad to see others who belong to our cohort enjoying the music. With this performance and what we have heard at Harpa (the concert hall) and during Reykjavik’s Culture Night, we have been exposed to a wide range of Icelandic performers of techno, rock, classical music, and traditional Icelandic songs. This is truly an artistic country. On Friday at 12:46, our Embassy gathered around our flag to honor the memory of the nearly 3,000 innocents we lost on September 11, 2001 and to reflect on the importance of keeping true to their memory. Several friends joined us and among them was Gunnlaugur Erlendsson, an Icelander who happened to be in New York on the fateful day and who volunteered to assist our search and rescue workers in their search for survivors. We expressed our gratitude to Gunnlaugur, which we also extend to the Icelandic nation for their many offers of assistance and their heartfelt sympathy for us in the wake of that tragic day. Much has been written and said about "the hidden people," elves, gnomes, and trolls in Iceland. Many of us from the outside wink, enjoy the stories, and move on. My elf experience in Borgarfjörður, just below Álfaborg (the capital of elves and fairies), was a bit different when I visited the Álfasteinn or the Elf Stone Museum. While my wife, Josh Rubin and I crawled into the replica of an elf family dwelling and listened to the tale of Snotra the Cursed Queen, it was easy to be drawn into the story and imagine the world of elves and their interaction with humans. This was possible thanks to the dedication of Bryndís Snjólfsdóttir and Arngrímur Viðar Ásgeirsson who built the Álfasteinn Museum. Borgarfjörður also hosts a museum about Jóhannes Kjarval, Iceland’s greatest painter, who spent much his life in the area and drew amazing portraits of the townsfolk. The visit was capped with the unexpected appearance of minke whales in the fjörd. Their appearance reminded me of Kjarval's stern opposition to whaling all those years ago when it was less controversial. He was truly a great man and a visionary. employment benefits, Fjarðaál has shown the true meaning of corporate social responsibility. Alcoa supports projects and activities that strengthen several communities in the area. Of particular note is its "Alcoa Foundation," which is a partnership between Alcoa and several NGOs aimed at supporting the environment and equal employment opportunities. Fjarðaál's investment model is truly unique and beneficial to host communities. I suspect many other communities in Iceland would love to partner with Alcoa. Vopnafjörður hosts the East Iceland Emigration Center in Iceland. As with many such institutions, this one is the result of the dedication and hard work of individuals committed to the preservation of ties between North America and Iceland. In this case, Cathy Josephson moved from Lyon County, Minnesota to Vopnafjörður in 1995 after visiting Iceland and discovering her roots. Ever since, Cathy has helped Icelanders, Americans, and Canadians reestablish family connections lost long ago. We arrived the day after an American family had met for the first time their long lost relatives in the area. It was a clearly moving moment for the families and Cathy. 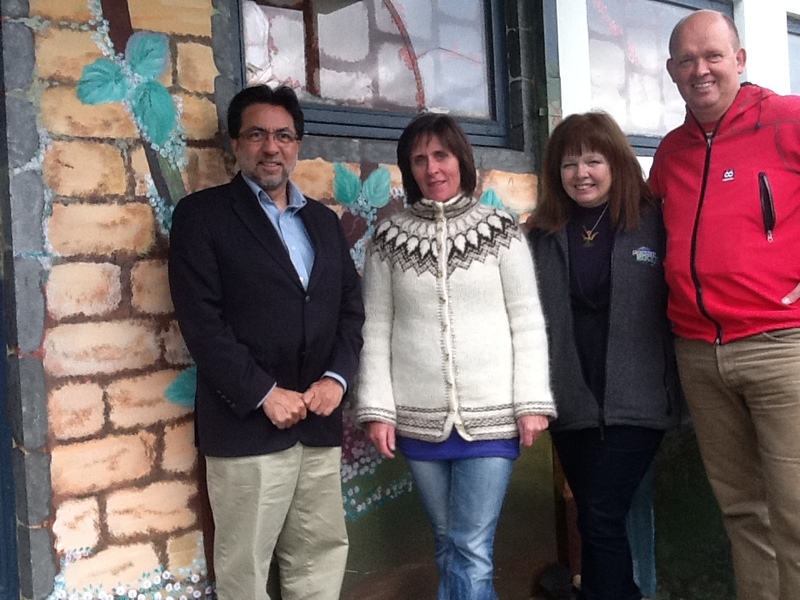 We also met with Þórunn Egilsdóttir, the Chairman of the Vopnafjörður Town Council. She shared with us her optimism that oil, gas, and mineral exploration in the Drekki area off the Icelandic Coast will bring much needed investment and economic activity to the region. Wow! It has been quite some time since I have experienced the energy, creativity, and inspiration of Danilo Perez's music. His performances in Reykjavik received wide acclaim and he touched Icelandic artists like I haven’t seen before. Danilo also commented that his Icelandic audience was the best he has had and was most impressed by their impromptu performances. Jazz is truly a music that brings people together and Danilo epitomizes the world musician who transcends cultures and geography. We are very proud to have partnered with the Reykjavik Jazz Festival in bringing Fulbright scholar and master jazz pianist Danilo to Iceland. This also gave us an opportunity to highlight diversity in the United States and to share the contributions of Hispanics to American culture as this month we commemorate Hispanic Heritage. We’ll be talking about this for a while.